This graph, from the WMO Statement on the State of the Global Climate in 2017, shows the history of CO2 concentrations in the atmosphere. Since 1958, we’ve measured CO2 directly. To measure CO2 prior to that, we use “proxies”; that is, measurements that stand-in for direct measurement. An excellent proxy is ice core data. We can drill ice cores and measure the CO2 that’s trapped in ancient ice–almost as good as a direct measurement. The oldest ice cores to date go back about 800,000 years. To measure CO2 concentrations older than that we use other proxies, including leaf fossils, and ocean and lake bed sediments, among others. The graph accompanying this post can be a bit hard to read if you’re not used to seeing data presented this way. Essentially it shows that 50-60 million years ago we had a very warm period caused by high levels of CO2 in the atmosphere; this coincided with trees growing in the Arctic! We don’t know exactly what caused this very warm period; possibly massive and continuous volcano eruptions over a long period that emitted huge amounts of CO2. 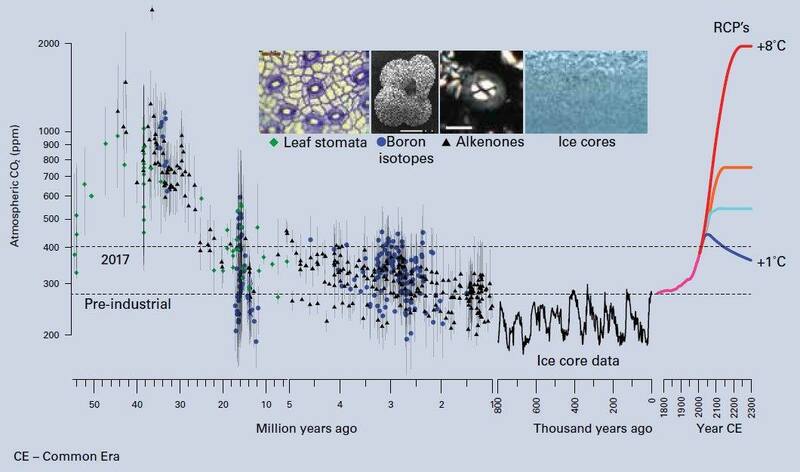 During the period of 800,000 years ago to 10,000 years ago, you can see the ups and downs in CO2 (and, correspondingly, temperature) which led to the ice ages coming and going. This up and down of CO2 was primarily caused by the wobble in the Earth’s axis leading to greater or lesser warming of the poles. For the last 10,000 years we had very stable CO2 levels… until about 1800, when we humans started pouring massive amounts of CO2 into the atmosphere from burning fossil fuels. Now CO2 levels are higher than they’ve been for about 3 million years, and we are on a trajectory (“business as usual”) to match the CO2 levels of 50-60 million years ago, if we don’t turn things around.